A new era in American space rocketry dawns next week as the Atlas 5 soars on its maiden voyage, carrying with it Lockheed Martin's future in the commercial satellite launch industry and the U.S. military's hopes for reliable access to the final frontier. At 6:05 p.m. EDT on Wednesday, August 21, the rocket's Russian-made main engine will belch fire into the flame trench of the rebuilt Complex 41 at Cape Canaveral Air Force Station on Florida's eastern coast, triggering the start of a tension-filled half-hour flight to place the Hot Bird 6 communications spacecraft into orbit for Paris-based operator Eutelsat. If successful, the Atlas 5 will be keenly positioned to compete with the European Ariane 5, Boeing Delta 4 and the international Sea Launch venture in the fiercely competitive market to get satellites into space. "It is probably, arguably the most important launch in the history of Atlas," said John Karas, Lockheed Martin's vice president for Atlas 5 development. Today, there are more rockets available than satellites to launch, creating a cut-throat atmosphere between rival companies. That, coupled with the fact Lockheed Martin has spent a billion dollars of its own money developing Atlas 5 and its new launch site, means the stakes are enormous that Atlas 5 doesn't stumble out of the gate. "There is at least double, if not triple, over-capacity. The government market is stable but not growing right this minute...and the commercial market is depressed. So he that launches first, and successfully and often, is going to have a big impact on their continuing business case," Karas said. "So this is as important as it gets." Although confident the Atlas 5 will succeed the first time it's put to the test, Karas acknowledges that space flight is still a challenging endeavor. "It could all change in a New York minute one way or the other. We just hope we have done our homework. You haven't done anything until you get to orbit, the correct orbit." Born in the 1950s as the United States' first Intercontinental Ballistic Missile, the Atlas vehicle was transformed into a space launcher, propelling John Glenn away from the planet in 1962 to become the first American to orbit the Earth. Over the past 40 years, Atlas rockets in numerous configurations have launched hundreds of times carrying scientific, military and communications satellite cargos. The commercial generation for Atlas took to the skies in July 1990, marking the first of six different versions of Atlas to fly, each building on the success of the predecessor and becoming more powerful in order to lift larger satellites. All were successful in their inaugural launches. Atlas 5 would extend that remarkable streak to 7. "We have this constant evolution and improvement in the vehicle, which improves the performance of the rocket and improves the reliability and proves the future of the next step," Karas said. In fact, Lockheed Martin has already flown a majority of the Atlas 5 systems on its Atlas 3A and 3B rockets over the past two years, including the Russian RD-180 engine and the Centaur upper stage and its Pratt & Whitney RL-10 engines. "We have flown two Atlas 3s successfully. From our perspective we probably have retired 80-85 percent of the risk for the Atlas 5. The real unknown we have is the rigid-body Common Core Booster, but that is just a structural element," said Adrian Laffitte, Lockheed Martin's director of Atlas launch operations at Cape Canaveral. "We have always had a manageable risk evolution approach, retiring risk, flying it, retiring the (older) models and providing higher reliability and higher performance to our customer. We have really good success shown by our previous Atlas success history," Karas added. The Atlas fleet is currently riding a string of 60 consecutive successful missions, dating back to 1993. In addition, every Atlas 2 and 3 series rocket ever launched has been successful. "This is evolution, not revolution. We have used proven technology all the way, and we believe that this will pay benefits in reliability, cost control and a whole range of other factors as we go forward and commercialize this product," said Eric Novotny, vice president of marketing for International Launch Services. ILS is the joint U.S./Russian firm that globally markets Atlas and Russian Proton rockets. "Satellites are getting bigger, they are getting heavier. As a result, launch vehicles have to grow to meet those requirements. Customers are building larger satellites, they have higher power, they have longer life. 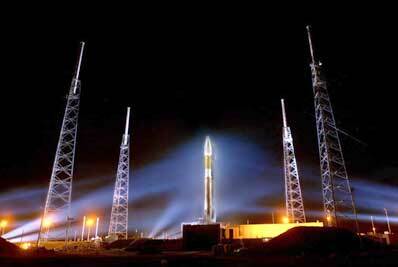 And to meet that, that's how Atlas 5 fits into the picture," Novotny said. Affectionately called "dial-a-rocket" by Lockheed Martin officials, the Atlas 5 is actually a family of vehicles that use the same "Common Core Booster" first stage and "Common Centaur" upper stage. What distinguishes the different vehicles is the size of the nose cone that encloses the payload during the trek through Earth's atmosphere, how many solid-fueled rockets are strapped to the first stage and the number of Centaur engines. The concept of common stages allows the addition of an Aerojet-made solid rocket motor to incrementally increase the amount of payload the rocket can launch. For this first launch, the Atlas 5 will fly in the 401 configuration -- the simplest and least powerful in the family, capable of carrying 10,910 pounds of cargo into geosynchronous transfer orbit. It will have a four-meter nose cone, no solid motors and one Centaur engine. Later Atlas 5s will feature a five-meter fairing to accommodate larger satellites, up to 5 solids to lift the heavier cargos and as many as two Centaur engines. For launch into geosynchronous transfer orbit, a 551-version rocket with a five-meter fairing, five solids and one Centaur engine can carry 19,100 pounds. A 552 with two Centaur engines can heave 45,200 pounds into low-Earth orbit. Also in planning is the Atlas 5-Heavy, which would take three Common Core Boosters and strapped them together for a triple-body rocket with a Centaur and the larger fairing to loft massive cargos into orbit. Atlas 5s will lift off from the "clean pad" at Cape Canaveral's Complex 41, the site where -- among various other scientific and military satellites blasted off atop Titan rockets -- NASA's twin Voyager probes departed for their tour of the outer planets 25 years ago. Unlike the conventional idea of assembling a rocket on the pad, which requires large towers and at least weeks of pre-launch processing time, Lockheed Martin has instead built the Vertical Integration Facility to serve as the Atlas 5 assembly building. Inside the VIF, the rocket stages are stacked together atop a mobile launch platform that is rolled 1,800 feet to the open-air pad the day prior to liftoff. Eventually, officials expect to shrink the on-pad time to about 12 hours. Because the rocket is designed to withstand winds of over 60 knots and protected by four large lightning masts around the pad, a mobile service structure isn't needed to shield the rocket from the weather. The Atlas 5 will sit on the pad exposed, undergoing final checks and fueling. The "clean" concept and relatively fast-paced processing time in the VIF, Lockheed Martin says, will allow for much quicker turnaround between liftoffs in contrast to today's launch pads. The idea for Atlas 5 goes back almost 10 years when the U.S. military began studies to modernize the capabilities of space launch by enhancing reliability and reducing costs. "There is a long history with trying to improve our capabilities in the launch arena and to meet the government's needs," Air Force Lt. Col. Tony Taliancich of the Evolved Expendable Launch Vehicle System Program Office recalls. "In '93 we stepped back and said we needed to really focus on what we are trying to do here and how do we get to where we need to be." The Pentagon elected to create the EELV program to replace the older Atlas, Delta and Titan rocket programs with the new Atlas 5 and Boeing Delta 4 rocket concepts, which promise to be more reliable and reduce costs by 25 percent over the heritage vehicles. The Air Force projects that EELV will save $6 billion in overall launch costs between 2002 and 2020. Boeing won the lion's share of initial Air Force EELV launches, which were awarded in October 1998. After some restructuring of the manifest and the addition of a Delta 4 test flight paid for by the Air Force, Boeing has 22 government EELV missions and Lockheed Martin has 7. To ensure vital military payloads have a ride to space, Atlas 5 and Delta 4 are capable of backing up each other, allowing the government to switch a satellite to the other rocket if one is grounded. "When you talk about assured access to space, it is important for the government in a national crisis to be able to get its assets up on orbit. So one of our fundamental premise is looking for a way to make sure that if one vehicle had a problem we could move the satellite over in a reasonable amount of time and continue to meet the national security requirements," Taliancich said. The first Air Force EELV mission, scheduled for December aboard the second Delta 4 rocket, will place a Defense Satellite Communications System spacecraft into Earth orbit. As a precaution, the government has already paid Lockheed Martin to complete the early work to prepare for launching the satellite aboard an Atlas 5. "The Air Force started early integration over a year ago on a limited basis and we could be six months away from launching DSCS on Atlas 5 if anything happens," Karas said. Over the past four years as the two EELV rocket systems were being developed, the Delta 4 was slated to launch before Atlas 5. But Boeing has encountered delays with the new RS-68 engine that will power the rocket and construction of the launch pad at the Cape's Complex 37. The debut of Delta 4 is now expected in late September or early October. Although Atlas 5 has also slipped a couple months from its target launch date, Lockheed Martin will be the first to field an EELV rocket. 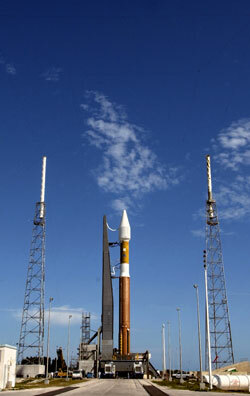 "It is hard to express the importance to this (first Atlas 5) to the overall space program," said Taliancich. "We have been making a lot of decisions lately based upon world events that demonstrate the importance of the space element of our national security infrastructure. "(EELV) allows us to continue to meet the national need for security delivered from space -- whether it be intelligence, communications, global positioning, early warning. All of those systems have to have a reliable, affordable way of getting there. Reliability improvements that EELV is making, that Lockheed Martin is making in their systems, some of the availability, operability improvements, significantly enhance our ability to make sure we maintain national security." But being first won't mean anything if the launch is a failure. "We have been focused on trying to do it successfully, not so much of who gets there first," said Laffitte, who also serves as Atlas launch director. "Our No. 1 goal is to make sure that when we launch we are ready launch. It's sorta like when the airplane is ready to take off, you want to make sure that pilot is not going to say 'oops, I wish I was on the ground.' If in the process of focusing on that, we happen to the first, that is just gravy. But that is not the driving force." This is the first in a series of stories that will preview next week's launch. Look for a tour of the Atlas 5 launch site, a technical overview of the rocket and much, much more throughout the week. 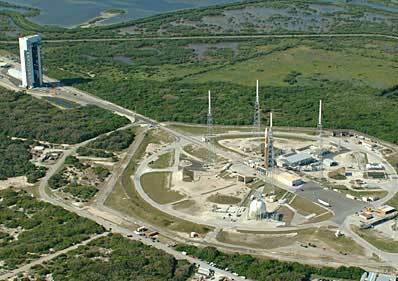 And, of course, we will provide the most thorough live coverage of Wednesday's countdown and launch. Launch timeline - A preview of the events to occur during the first Atlas 5 launch. 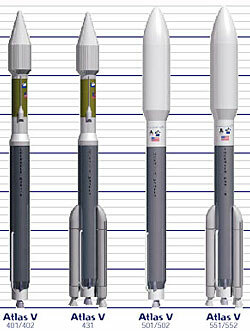 The rocket - Technical story of the new Atlas 5 rocket family. Complex 41 - A tour of the Atlas 5 launch site and description of the "clean pad" concept. Dual ops - Current Atlas rocket models not going away for awhile. Hot Bird 6 - Learn more about the satellite cargo for the first Atlas 5 launch. The weather - A look at the challenges of forecasting the weather for Atlas 5.